Figure A34a. Gibraltar anomaly, interpreted as the Gibraltar slab, with (horizontal) [vertical] cross sections through (A)[D] the UUP07 p-wave) and (B)[D] the combined SL2013 and S40RTS s-wave models at 270 km; C) the location of the modern geological record that we interpret to have formed during the subduction of the slab. 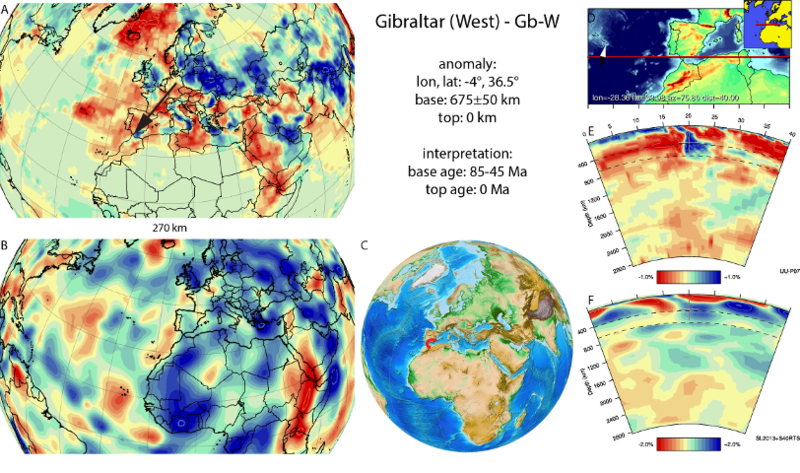 The Gibraltar anomaly (Figure A34a) is located in the upper mantle below the Alboran Sea. Its base is resting on the 660 km discontinuity, and it is still connected to Atlantic crust in the west, is dipping eastwards and is interpreted as subducted lithosphere. Below southern Iberia, the slab curves into an E-W strike, dipping southwards, and is largely detached (Figure A34b). The first tomographic images of subduction remnants in the Gibraltar region imaged the E-W trending, detached portion below southern Iberia (Blanco and Spakman, 1993) and interpreted subduction in the Gibraltar region to have occurred southwards. 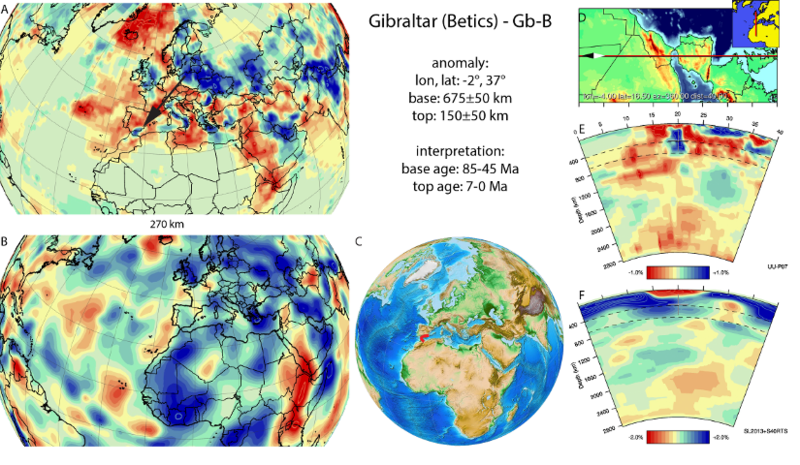 With the advent of more advanced tomographic models it became clear, however, that the Gibraltar slab is curved, and mainly dips eastwards reaching the 660 km discontinuity (Gutscher et al., 2002; Faccenna et al., 2004; Spakman and Wortel, 2004; Bezada et al., 2013; van Hinsbergen et al., 2014). Since plate convergence between Iberia and Africa is only 100-250 km (increasing eastwards) since the Cretaceous, the bulk of subduction of the Gibraltar slab must have resulted from roll-back. Assuming that the slab did not stretch significantly, subduction of the Gibraltar slab started below the Balearic islands (Spakman and Wortel, 2004), with plate circuit and geological constraints suggesting an onset of deep underthrusting around 45 Ma following very slow convergence between 85 and 45 Ma (van Hinsbergen et al., 2014), culminating in roll-back since ~27 Ma (Lonergan and White, 1997; Rosenbaum et al., 2002b; Faccenna et al., 2004; 2014). The E-W trending, south-dipping portion of the Gibraltar slab below southern Iberia likely resulted from >180° counterclockwise rotation during roll-back (Rosenbaum et al., 2002b; Chertova et al., 2014; van Hinsbergen et al., 2014) and its detachment likely occurred following the arrest of rapid thrusting in the sub-Betic fold-thrust belt, around 7-8 Ma (Platt et al., 2003; García-Castellanos and Villaseñor, 2011; Argnani et al., 2016). Figure A34b. Gibraltar anomaly, interpreted as the Gibraltar slab, as imaged below the Betic Cordillera, with (horizontal) [vertical] cross sections through (A)[D] the UUP07 p-wave) and (B)[D] the combined SL2013 and S40RTS s-wave models at 270 km; C) the location of the modern geological record that we interpret to have formed during the subduction of the slab.